Architect Conrad Alfred Meussdorffer was one of the most notable architects of apartment houses in the City. 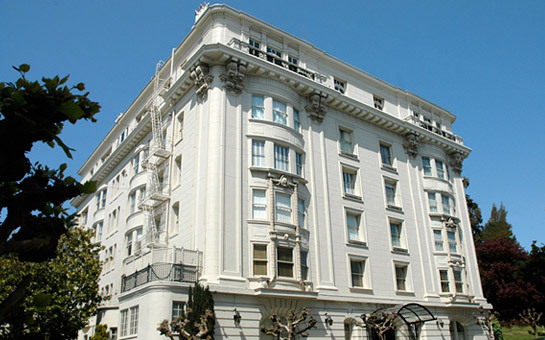 Among his most prestigious designs are the cooperative apartment buildings at 1925 Gough, 2006 Washington Street and 2500 Steiner Street in Pacific Heights. The building is situated on a private parcel in Lafayette Park surrounded on three sides by park greenery. Its handsome symmetrical façade with Beaux Arts influences features a gracious wrought-iron and glass canopy, rounded bay windows, ornate corbels, pilasters & running dentils and a set of four tall wrought-iron & glass sconce lanterns. Enter the warm and inviting lobby through tall double doors with handsome brass work. Tall arched mirrors and multi-lamp sconces on opposite walls reflect infinity. Ascend the elevator to the apartment located on the third floor. The magic of this apartment is in the elegant scale and proportions of the public and private rooms, many of which are infused with natural light and enjoy the verdant outlook. The exceptional floor plan of the apartment provides spacious, light and airy rooms and a wonderful ambience for elegant entertaining and comfortable City living. The expansive FOYER is a room within itself. The beautiful hardwood floor continues to all the public rooms. The formal LIVING ROOM is an elegant space in which to entertain guests. It is graced with deep crown molding, a curved bay window and an ornate marble fireplace. The adjoining LIBRARY features a built-in wall system for books and objects d’arts. The formal DINING ROOM across the foyer features crown & picture molding and chandelier. It can comfortably seat a large party for elegant dining. The adjoining BUTLER’S PANTRY with ample glass front cabinets & bar sink and large KITCHEN with pantry await the new owner’s custom installation. From the foyer, proceed along the gallery to the unusually spacious MASTER SUITE comprising the MASTER BEDROOM and the glorious SOLARIUM, infused with natural light all day long in the lovely setting of Lafayette Park. The MASTER BATH adjoins. Four additional BEDROOMS and three BATHROOMS provide ample quarters for the household and can easily be adapted according to the owner’s needs, including guest rooms, at-home office and family/media room. The powder room, laundry room and the smallest bedroom with bath are all located off the gallery, along with ample closets and service entrance.